View the current installation, configuration, and connection status of agents. Agent status automatically updates in the list view as the information becomes available within OpsCenter. Use the features in the Agents view to set up, upgrade, and configure agents when the status prompts indicate issues and provide buttons to launch the agent installation processes. Interpret the information provided to troubleshoot agent installation, configuration, and connections. Click cluster > Nodes > Agents tab. Agent issue indicators: If displayed in the Agent issues detected banner at the top of the OpsCenter workspace, click the Show Details > problems link. The banner displays for agent issues that require immediate attention, such as incompatible agent versions or connection issues. A red exclamation mark on the Agents tab also indicates there are issues that require your attention. The Agents status page is divided into Healthy, Pending, and Unhealthy sections depending on the current status of your environment. Any unhealthy DataStax agents that need attention appear at the top of the list. Also see Installing DataStax Agents. An Upgrade all agents button is available to upgrade nodes that have an incompatible agent version installed. To view which services might be adversely impacted, click the What is impacted link. Note: When the upgrade all agents prompt is displayed, DataStax recommends upgrading all agents immediately to avoid any loss of functionality. An Upgrade agents button is available to upgrade nodes that do not have the most current version of the agent installed. Note: DataStax recommends keeping the installed agent versions up-to-date and homogeneous on all nodes. For more details, see DataStax agent version compatibility with OpsCenter version below. A Set Up Agents button is available to queue installation for any nodes that currently do not have the agent installed. A Configure Agents button is available when agents cannot connect to OpsCenter because the agents are misconfigured. Click Configure Agents to update the STOMP configuration for those agents. To view more details about the current state of an agent, click anywhere in the row for the agent. 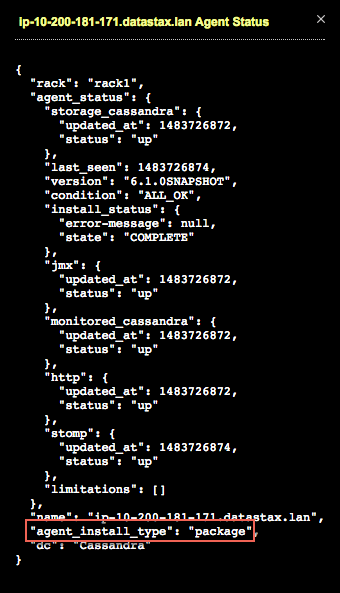 A JSON representation of the agent status details is displayed. The condition of an agent and the status of its individual services is visible. The type of agent install (package or tarball) is also indicated. Agent version is earlier than OpsCenter 6.1.0. For example, 6.0.3 as shown in the agent issues image above. Incompatible versions require upgrading agents. Red exclamation point in for installed status in the Last Known Version column; the Upgrade all agents button and What is impacted link are present. Agent version is not up-to-date with the OpsCenter version but is 6.1.0 or later. For example, OpsCenter is version 6.1.2 (future hypothetical release version) but the agent is version 6.1.1. Going forward from OpsCenter version 6.1, OpsCenter has improved backward-compatibility with agent versions for future releases. Partially compatible versions. The currently installed version of OpsCenter is backward-compatible enough with the currently installed agent version so as not to cause any loss of service. Upgrading the agent version is recommended. Yellow warning bell indicates that there could be some incompatibility but agents degrade gracefully. Agent version is equal to OpsCenter version. Completely compatible versions. Ideal scenario. Green checkmark for installed status in the Last Known Version column. (rotating green circles) Currently installing, configuring, or upgrading an agent. (greenish yellow clock) Agent install job pending. (yellow question mark) Unknown status. 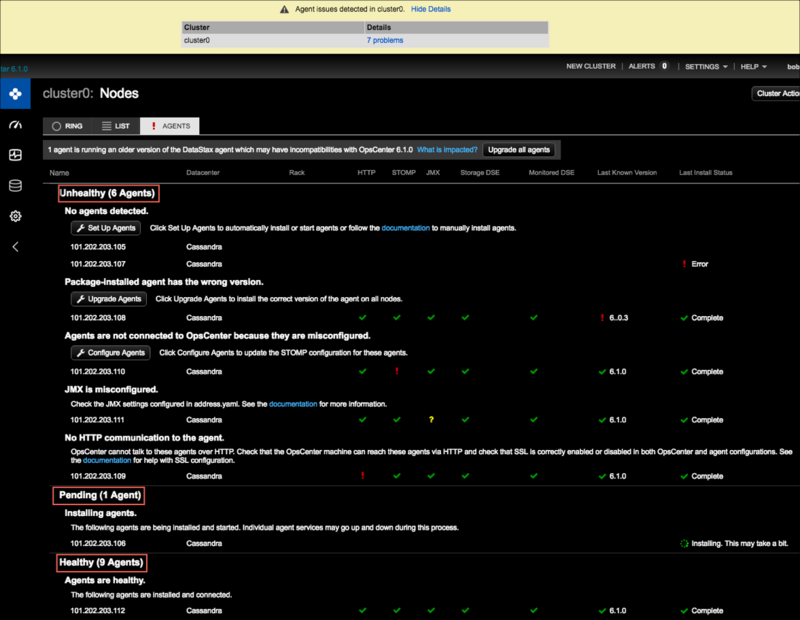 (red exclamation point) Down, incompatible version, agent install failed, or some other issue status as indicated in context within each column in the Agents status view. (greenish yellow warning bell) Agent version limitations; partially compatible agent versions. (green check mark) Up, satisfactory, or install complete status.